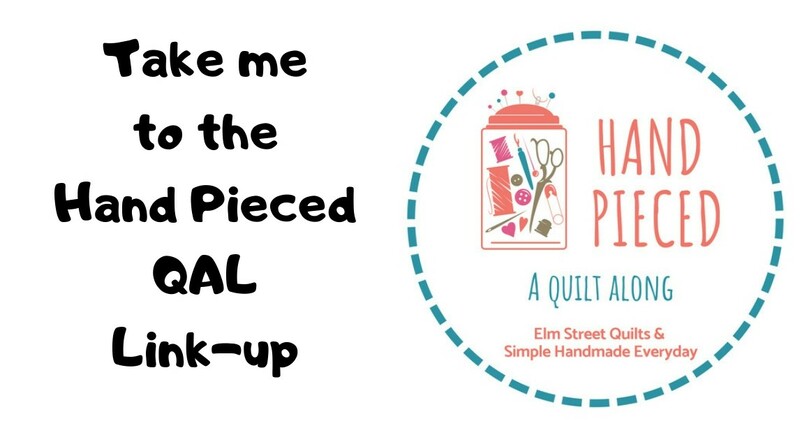 Fat Quarter Shop is kicking off a fun tutorial and QAL today for a Jacob's Ladder quilt. 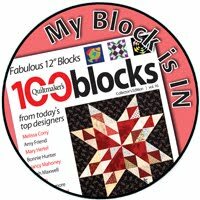 You can find information about the pattern, a tutorial for the block and several options for sizes of quilt on the Jolly Jabber blog. The pattern calls for 12 1/2 '' square unfinished blocks. Please visit the Jolly Jabber blog for block assembly instructions. Their directions are excellent! I wanted to use a bunch of leftover layer cake squares for my Jacob's Ladder quilt. Since layer cake squares are 10'', I downsized the pattern to produce (unfinished) 6½'' square blocks. I quilted my table top mini quilt with diagonal lines resulting in a diagonal checkerboard effect. my quilt finished ~14''square. To make my mini, I paired a dark and light layer cake square together and cut as shown below. Each pair of layer cake squares yield two (2) blocks. Each of the HST and 4-patch blocks will be 2 ½'' (unfinished). I've got plenty of leftover layer cake squares. Once I finish my stash busting churn dash quilt, I'm making some more Jacobs Ladder blocks from my layer cake stash. Please visit the Jolly Jabber blog for block assembly instructions. My Jacobs Ladder quilt will be linked up with Main Crush Monday's, Freemotion by the River, WIP Wednesday's, Let's Bee Social, Midweek Makers. Fabric Frenzy Friday, Finish it Up Friday and Finished or Not Friday. I will also be linking up with Tips and Tutorials Tuesdays. This quilt is finish #6 for 2017. All of the finishes (so far) have been mini quilts. Great idea! It turned out super cool! Great colors Patty! This was really a fun quilt project to do! Gorgeous! Thanks so much for the diagram! 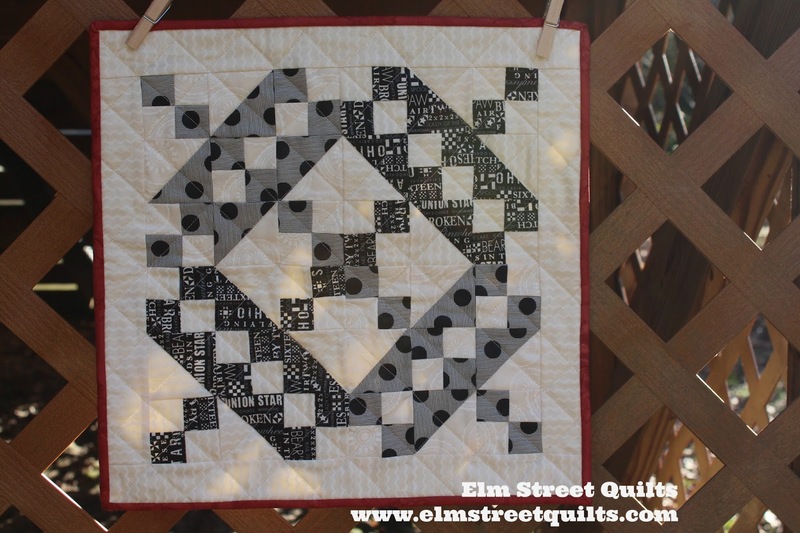 Fantastic mini quilt! Love those fabrics! This is beautiful and I love how easy you made it look to cut out the blocks. Thanks for sharing your lovely mini! What a cute mini quilt and fun arrangement. Thank you so much for linking up! What a great way to use up some layer cakes. 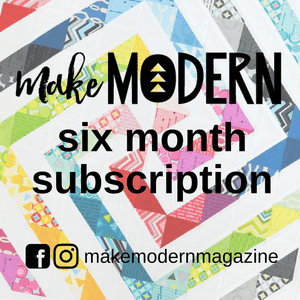 Love your mini quilt! Loving this quilt! It's so pretty! I just love black and white with a pop of red. Great choice! I love your quilt! What a great way to use leftover 10 inch squares -- I'll will definitely give this a try. Thanks for sharing!